In early January 2011, Heba El Kayal, Lifestyle Editor of what recently was The Daily News Egypt, reached out to me, spinning my head with her subdued charm. Setting a date on email to Skype, I wondered what it was that she would ask me and why she had chosen me to interview, an unemployed Egyptian food blogger living in Kuala Lumpur. All I had ever done was milk out every bit of silliness I had in me for my blog, that coupled with a recipe to go along with said dose of triviality. Meeting her for the first time through a screen allowed me a glimpse of cold Cairo on a winter morning. Having had to suffer through many a female more concerned with proving through her dress sense that she had what it required to pull off her job, Heba caught me off-guard. A connection was formed at once. Bundled up on her bed in a robe and glasses, she greeted me as an old friend as I was quickly taken through the history of The Daily News Egypt. She was interviewing me because she was always on the look out for new talent. She was interviewing me because she thought I deserve some recognition. I did not see myself as talent; just effort and a little luck. Today, I have been the weekly food columnist for a year and a good quarter. The Daily News Egypt interview about my blog resulted in an opportunity to write regularly, to sharpen my skills, and most rewarding of all, to find sisterhood in a passerby. Heba, I cannot express my appreciation enough - for the days you pushed me to get out of my funk and fly, for the days you embraced my weaknesses and often, sadness. Thank you for being my editor, my keeper, my friend. Bring the water and chicken stock to a boil. Add the orzo to the pot and stir for a moment to ensure that it doesn't stick to the bottom. Cook uncovered until the orzo is al dente. While the pasta is cooking, combine the chicken, bell peppers and olives in a large bowl. Mix half of the chives into the salad. When the orzo is ready, strain and toss through the other ingredients. In a small bowl, mix together the olive oil, lime juice, mustard, chili powder, garlic, salt and pepper to make a light dressing and pour over the orzo salad mixing gently as you go along to ensure it coats the salad ingredients. Garnish with the second half of snipped chives and serve chilled. I grew up wearing shades of watermelon, tangerine and aqua; colors I was taught by my mother. In our home, there was never use of the unadorned word blue, only baby blue, navy blue, royal blue and petrol. This is how she saw the world and what drove us, my sister and I, to look out for new colors and to use them regularly; compelling color names like vermillion and viridian were the winners where I was concerned. Only later did I notice that the everyday brown never made an appearance in our house. The closest we had gotten to finding something “brown” in our closets or rooms was in fact a cross between terra cotta and rust. When winter would come and the city’s people would shed their summer spirit to shroud themselves in tones of wet sand and dusty leaves, my mother would be the lady crossing the street in the scarlet coat. On a clear day in Abu Dhabi, she took me, her newly turned eleven year old, shopping. Enthusiastically, I picked up a brown button-down dress and asked her what she thought, hoping that she would agree that it was the dress for me. “I don’t like brown,” she said as she walked a few steps ahead to lift up a dusty rose blouse, delicate and demure. Soon after my university years, I took a trip alone to Abu Dhabi to reconnect with friends and the city I had seen solely through the biased eyes of my childhood. There, I bought a fitted brown t-shirt and several other brown garments that surprised my mother upon my return and me for breaking away if only a little from my love of standard black. In my mid-twenties, I started taking fewer photos of muted faces in black and white and more photos of food, dipped in gloss and drenched in color. It was apparent through time that brown did not hold well in still life and could rarely come alive aside from molding itself into the egotist of brown food, chocolate. For the simplest and most delicious of brown foods, sauces included, I would have to learn to make them shine; to garnish with parsley, with julienned shallots, with cheese tuiles. But brown dishes are not the only thing I learned to eat voraciously while shielding my mess of a plate from my scrutinizing camera lens. I am yet to photograph a bone-in shank that looks appetizing and a while back, I struggled with coconut milk mussels before getting a shot that would flatter them with their quivering soft insides, a tell-tale sign that we may not all be beautiful on the inside. Some foods shine on their own and excel under a macro lens while others struggle, pleading with you to place them on a layered table setting with a few star props in natural light. When photographing your food for others, it is imperative to do some organization for it is never a picture-perfect snapshot moment, even when it’s the most vibrant of red velvet cakes. Find your grandmother’s detailed silver spoons and old cookbooks to place in the background, even tattered pages and parchment paper work to give your photo some depth. Consider your surroundings and learn to work with them. You will find that you need not an awe-inspiring place to work in; just some stable sunlight, a reliable camera, a simple dish and your imagination. Begin by creaming the butter and the sugar in a stand mixer until completely blended and fluffy. Add the eggs and egg yolk and mix again for 30 seconds. Add the flour gradually, allowing every ¼ cup to incorporate into the batter before adding the next ¼ cup. Scrape the sides of your bowl every now and then to make sure everything goes in. Pour in the vanilla essence. In a separate bowl, toss the blueberries in some extra flour until coated then add to the batter. This will allow the blueberries to hold their place avoiding having them pool at the bottom of your cake tin. Add to a small greased loaf tin. This is not a big cake and is meant to finish quickly in both prep work and eating time. Pop your cake into the oven at 170 degrees Celsius. There is no need to preheat. Allow the cake to bake for approximately 45-50 minutes (until a knife comes out clean). When done, remove from the oven and allow to cool for 10 minutes before extracting from the tin. Blueberry sauce: In a medium-sized saucepan, combine the blueberries, water, sugar and lemon juice on medium heat. Stir often until it comes to a low boil. In a separate bowl, stir the cornstarch into 2 tablespoons of cold water until dissolved. Gradually stir the cornstarch into the blueberry mixture. Simmer on medium-low heat and stir every so often until the sauce has reduced and is thick enough to coat the back of a metal spoon. This should take around 7 minutes. Take the sauce off the heat when read and stir in the freshly grated lemon zest and vanilla extract. If you’re using vanillin, stir it in when adding the cornstarch. Feel free to add more sugar; some blueberries are not as sweet as others. To thin out your sauce, add in a few drops of hot water at a time and stir until you reach your desired consistency. When I was in the 6th grade, a beautiful girl, blond and bright-eyed, walked into class midday to unknowingly capture the hearts of boys that we had marked as our own for the future. There was not a girl in class that did not feel the sting, an abrupt glitch in our hearts. She, with her fair and delicate skin, had come to teach us about jealousy, about lust and most unexpectedly, about Swedish food. Hawk-eyed and sidelined, the rest of us chomped down on simple sandwiches made by our tired moms as she sat alone on cold steps with a gaggle of young men in the making, waiting to make a move. Slowly, she lifted her carefully packaged sandwich along with a box of sliced tart apples from her red bag, unwrapping it to reveal two layers of white bread shielding the contents unknown to us, the brooding young ladies' corner. My curiosity peaked. While the little ladies surrounding me continued to rip her apart with their collective hunting strategies, I scrutinized from afar the corners of her sandwich, in part getting acquainted with my supposed enemy and, in reality, because I had always secretly judged people by what they eat. After days of having given her the cold shoulder, I made my way past the boys and over to the cold steps I never liked sitting on. "Want an apple slice?" I asked. "I have apples too! What kind, green or red?" she chirped, opening doors for my guilt of trying to hate her to multiply. “I also have a cheese and cloudberry jam sandwich! Maybe we can trade halves?” she urged on, trying like the new girl she was to be my friend, to leave an imprint on me. Cloudberries! I could not think of a prettier name for food and it was then that my mind switched on to cuisines unknown to me, away from the Middle Eastern-Indian influence dominating my surroundings. Later in my life, I read about cloudberries, made into jams and liqueurs, to discover that they are more tart than sweet; they often over-ripen to become creamy like a sweetened yogurt. I turned pages to envision sticky fruit soups, served hot and cold and of reindeer meat, pickled herring and the famous smorgasbord, the classic Swedish buffet spread. I can only wish to have a palate so accepting of such foreign flavors. Since it’s unlikely that I’ll find cloudberries to make jam with in Cairo, I decided to make hasselback potatoes, the baked potato of Sweden, crispy on the outside and fork-tender in the center, served aside a veal roast, as I think back to the short-term friend I had, who moved away before sealing friendships for life, who taught us about the grown-up world of food and men. Heat the olive oil in a pan on medium heat. Add the sliced garlic and saffron then season. Allow to bubble for 2 minutes then turn off the heat and set aside leaving the flavors to come together. Begin by moving your oven rack to the middle and preheating to 190 degrees Celsius. Prepare a large bowl of cold water and set aside. Wash your potatoes well before slicing. One potato at a time, make sure they don't roll over when placed on a flat surface. If they roll, cut a very thin slice lengthwise at the bottom to allow it to remain flat. Begin slicing the potatoes 3 to 4 mm apart never allowing your knife to slice through the potato disconnecting the slices. If necessary, lay down chopsticks or wooden spoons parallel to each other and use them as guides to know where to stop cutting. When you finish one potato, immediately drop it in the reserved bowl of cold water and continue with the rest. This will stop discoloration from occurring and will drain additional starch that may not allow the slices to fan out. Place the potatoes in a greased shallow baking pan after drying one at a time. Brush the potatoes with the melted butter and 1 tablespoon of olive oil then season with salt and pepper. 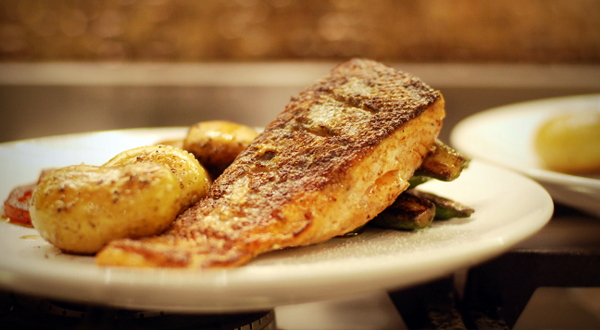 Cover the dish tightly with foil and bake the potatoes until just tender. This should take 35 minutes. Once tender, remove the foil and bake until tender for 10 more minutes. Turn your grill on after baking and grill for an additional 5 minutes. Once removed from the oven, drizzle with saffron garlic oil and serve. There is no greater way to describe how I feel after voting other than that I feel like an idiot. All the aunties and uncles were telling me to vote for specific people. It didn’t matter who they were, what they were doing or how they made their money — “Just go and vote! Trust me, we don’t want the people who’ll put the veil on us!” Fear and agitation filled many living rooms I’d visit. My mom’s housekeeper of 20 years instead voted for the people that have helped her area for several years by providing them with sugar, rice and everyday necessities. My mother-in-law’s housekeeper voted for the people who had the longest history and were “organized enough to do something with this country.” Different reasons, same vote. All that was asked of me by other people was to remember symbols. That’s how you’d find them on the list. Some of the most educated people in this country had resorted to picking out “trusted” symbols, spreading the message from one social circle to the next; and depending on which social circles you belonged to, the symbol you were to vote for would reach you by word of mouth. This was the absurd subliminal message being sent my way: if you vote for those who use kitchen appliances as symbols they’re more likely to force you to cover up but if you vote for those with hardware tools, they’ll probably try to fix the economy. Entering the polling station, a man leering over me grinned upon seeing my first tick and immediately pointed out where my next tick would be. He assumed that from the way I look, I would naturally be voting this way. How disappointing that we have all become stereotypes to one another. Despite feeling like an imbecile, I walked out happy to embrace the sights and smells of a winter morning in my beloved Cairo, a morning so sunny and bright with a spirited breeze trying to weave itself through my tightly-bunned hair. The man calling out on a megaphone that four satchels of garlic are for LE 10 behind two younger boys carrying warm baladi bread, an elderly lady peddling socks in front of a store stacked with jars of golden honey, the Ministry of Agriculture’s outlets lined up for unaware consumers to buy the unaware farmers’ produce — all reminding me of how delicately balanced this country is, holding on to hope and ever-creating chaotic beauty in such coarseness. How will we ever organize this country and if we do, will we lose our charm? In times of confusion, it’s comforting to turn to food, especially a dish so with one on the street. Asked over and over by the adults that act like adults in our family to refrain from midnight runs to get street food, I chose to pick up fresh Egyptian sogo’, or sausage, this time and conjure up a recipe as close to the fiery sogo’ sold at places that should place a warning sign on the door. If you too are being nagged about devouring mystery meat in the street, invite your friends over for a pseudo-street-food party. If you’re lucky, someone will bring in the real stuff and rave about your recipe while your gorge on their street-bought oil-drenched deliciousness. Begin by separating the sausage links. 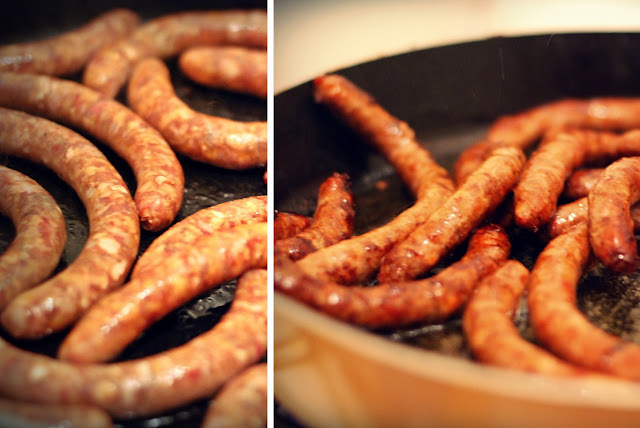 In a large pan, heat the ghee on high heat and sear the sausage for 3 minutes until browned. Remove and set aside. 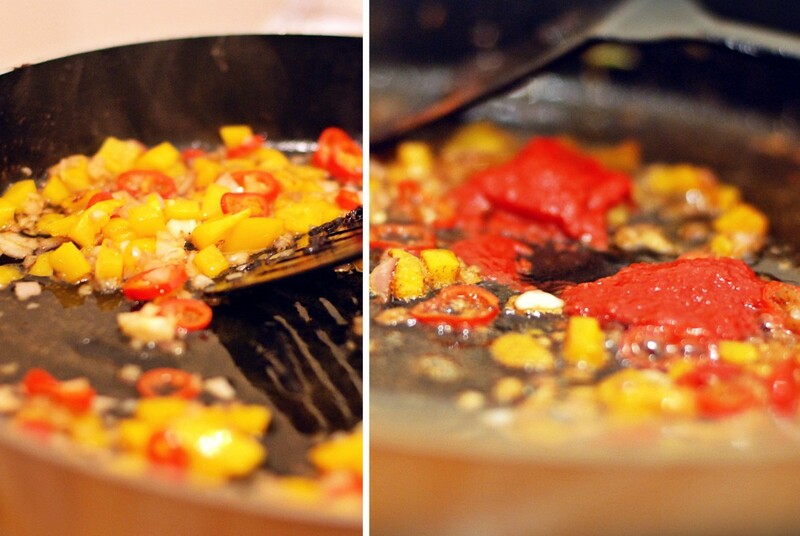 Lower to medium heat and using the same pan, add the onions, yellow pepper, chilli peppers and stir to release flavor. Add the cinnamon, cumin and chilli powder to the mixture and allow to cook for a minute. Spoon in the tomato paste and cook off for 30 seconds to break the acidity. Add the water and bring your sauce to a rapid boil. Add the sausage back into the sauce, reduce the heat, add the lemon juice and allow to simmer gently until the sauce is reduced by half. This should take about 20 minutes. Garnish with parsley. Serve hot with warm baladi bread to scoop up the sauce. I pressed a thin veil of tissue against my wounded knuckle, watching it absorb the red seeping out. “Stupid grater,” I mumbled as my husband laughed, reasoning with me that it was in reality a simple gadget, incapable of stupidity and that I was what my squash coach once called me — butter fingers. Despite my limited skill and short-lived efforts at squash and grating, I was determined to prove that I was anything but the clumsy Ms. Butterfingers my close ones made me out to be. Yes, I occasionally trip over raised sidewalk tiles and I'll admit that my unsuspecting knee has had troublesome encounters with protruding table corners, but surely those repeated incidents could not justify calling me such ludicrous names. Unlike my waned interest in thumping a ball to have it come back at me, I learned to grate correctly and to keep my knuckles away; but most importantly, I threw out my bizarre purchase of a grater that was comprised of an oval-shaped plastic refrigerator box, with interchangeable metal grater covers, that would not stand upright and might with the right lighting excite eager horror movie goers to enter my world of slashed knuckles. In its place, a pleasant box grater arrived with a comfortable white handle and tubed rubber at the base to limit sliding. Soon it was evident that it was sensibility that I might have been lacking and not skill. New mothers will buy baby food makers, hoping to join the next line of supermoms who make their own gourmet baby food; but could they not use a regular food processor or blender in its place? I am not one to judge for many of us have fallen victim to these gadgets that are piled onto the clutter already accumulating in our kitchens. You'll find people excited about their new buys: specialized banana slicers that come in sunshine yellow, blue rubber tubes dedicated to easy garlic-peeling, uni-tasking asparagus peelers and even skinny ovens pushed as pizza makers. Do we need any of this? After a good year of buying products I felt would make my life easier, I bravely faced up to my messy drawers packed with impulse buys and admitted to only needing some strong tools, an organized mind and a focused eye on time. Getting rid of my miserable garlic press that had only been used once, I understood why Anthony Bourdain, chef and author, called it an “abomination” and connected with his suspicion of the viscid juice that resulted to present us garlic-press owners with something he insists “ain't garlic”. It would benefit us all to instantly cease the silly spending and concentrate on technique — how to use a knife properly, what knives to buy and how to sharpen them. If we insist on churning out better pizzas at home, it's best to use unglazed quarry tile as a stone to extract moisture and crisp your crust. The kitchen has nothing to do with talent and equipment; there's only practice and an honest desire to gain in skill. This recipe asks for no fancy gadgets. It commands nothing but time and a sharp knife. Rewarding you with the warmth of steaming pasta, the peppery flavor of rocket and the richness of duck meat, it requires nothing more than a casual night at home as you contemplate the inevitable spring cleaning soon to come. Dry the raw duck with a hairdryer. Prick the duck skin with a needle at an angle to avoid piercing the flesh. This allows the duck fat to seep out and crisps the skin. Salt the duck all over using more salt than usual and let it rest for an hour. In a small baking dish small enough to hold them snugly, pour the ghee then place the duck legs skin side up. Pop in the oven and turn the temperature to 140 degrees Celsius. Cook the duck gently for 2 hours. After 1½ hours, the duck should be submerged in melted fat and the skin should begin to crisp. When this happens, turn up your heat to 190 degrees Celsius and leave to crisp until a golden brown. This should take 15 minutes. Remove from the oven and let it rest for 10 minutes before eating whole or shredding for pasta. In a large pan, melt the duck fat and butter then add the garlic. Cook on medium heat for a minute until garlic is fragrant then add the walnuts and stir. Add the rocket and cook for 2-3 minutes until wilted. Add the shredded duck, season with pepper liberally and salt minimally. Cook for 2 more minutes then add the cooked pasta and toss. Let the flavors meld for 2-3 minutes and serve up individually. I never thought I would miss Malaysia but I find myself regressing, filling myself with nostalgic desires, hoping to smell the salty stench of tandoori chicken as I lower my window to Cairo's smog. For close to four years, I stalked the streets of Kuala Lumpur, comparing the dated and the new of its streets to my Cairo; wondering which was the better city and if I was the right person to judge. I preferred how scorchingly sunny Egypt was to Malaysia's glimpses of light that I would so graciously receive between thunderstorms but equally inclined was I to thoroughly enjoy and perhaps favor the street markets, packed with hawker food stalls handing out the free smell of salted chicken gizzard satay, glazed with a sweet peanut sauce and completed with a fat dollop of fried chili paste. I miss the food in Malaysia. The rain cannot dampen the memories of intensely pleasurable eating. With all the things that make me feel at home in Cairo — friends, a common language and koshari — the fully stocked supermarket aisles leave me feeling empty. Why can I not find vanilla extract? I don't think anyone will be using it as an alcoholic drink anytime soon for them to be banning it from shelves. Why do I have to go to a store selling gourmet products to find fennel or bright and unbruised baby squash? Why is it so difficult to get Indian spices? I had become so desperate as to hunt through online forums for an Indian expat who would somehow hand over the address of a magician who makes Indian products appear when needed. My decision was made. I would not be visiting a supermarket for my regular food shopping trips but rather for larger purchases that do not necessarily include food items: detergent, tissue paper, floor cleaners. Instead, my husband and I chose to venture out into this huge city we belong to. Our finds were tremendous; dutch-processed cocoa, a dark reddish brown, was instantly snatched in the heart of Faisal Street, crunchy sesame-encrusted peanuts dipped in honey were brought home from Mohandiseen and rolls of thick cling film that doesn't tear at the slightest tug discovered at my current market of choice, Suleiman Gohar Street, right behind Tahrir Street in Dokki. This market is where I'll be every week, with no pre-written list to confine my buys. On any given day, I'll find butchers wiping their bloodied hands on their aprons as they grin at me, bakers packaging hot bread that has me finding the nearest place to make a sandwich, women draped in black selling freshly shelled peas and newly cored aubergines for a hot pot of dolma. All of this makes me want to take in more. A stroll down and minutes later, I'm met with an antique dealer looking as weathered as the table he rests his hip on and onward, a fun-spirited farmer wiping a date on his greige galabeyya, wooing me to break its flesh with my fingers before biting into its earthy sweetness. How can I not come back? Why would I return to regularly buying my food from a cold, sterile and mostly crowded megastore? Enough. I need some spirit in my food. So now that I've found a place that has given me some peace of mind, a glimmer of hope that I might truly find the most beautiful of ingredients in the raw right here in Egypt, I've decided to tackle recipes that I once made with ease in Malaysia due to the availability of what I needed. While I could not find whole black lentils in Cairo for this nourishing Indian lentil stew, dal makhni, I did pick up packs of split black lentils which worked well and shortened the cooking time. Branch out into the beautiful city of Cairo and you most likely will find. The little farmers and small grocery store owners on the street might need you considerably more than you think. Split this into three phases for easy preparation. Boil the lentils in hot water until tender. Begin testing for tenderness after 15 minutes. When done, drain and set aside. In a large pot, heat the ghee on medium heat until melted then add the turmeric, onion and chili and stir to combine. Add the garlic, cumin, cinnamon, ginger, chili powder and fennel seeds and stir once more. Allow the onions to soften and the spices to release their oils before adding in the curry powder then the tomato puree. Add the water and the pre-cooked dal and stir until it comes together. Bring it to a boil then add the chili powder, butter and cream. Simmer on low heat for no less than 30 minutes. I left it for an hour. Adjust seasonings and serve. I stretched, laying flat, fingers flopping around my side table in search of something to pull my hair up and away from my pillow-creased face. Happy to see some sun moving stealthily into the farthest corner, my corner of our room, I turned to find our bed empty — my husband already stirring his sweet coffee as he spoke on the phone. Popping myself off the mattress at a healthy 7:30 am, I prepared for a day filled in my mind with dog walks, deliberating ingredients and food writing. Never having been to a funeral prayer or a burial, I prepared to battle the tears that came for a military man I had met six years ago; a man whose eyes beamed volumes of understanding despite his tired body, whose patriotic achievements, forgotten by the young, stood witness to his good intentions and bravery. Although Uncle Hassan and I had shared few words and many a sincere smile throughout the home-cooked meals, burgers and ratatouille we ate together, I had never really gotten to know him outside of the stories, long and short, recanted to my listening ears; but as I sat praying for his soul, as my heart in constant sniffles merged with the Quran recited at his final place of resting, I could not have felt him to be nearer. There are fears that arise in you during burials, those that subside and those that bury themselves deep in you, surfacing only as cracks in your face. Of all the things that preyed on my mind, going back to sleep in the Earth I walk on bothered me no longer. Entering the wake days later, I watched as women walked in wearing their most somber faces to extend their condolences. As they sat on edge, slowly unraveling to reveal a more comfortable state, they went back to living — bejeweled hands caressing glasses of tea over a friend's endearing stories of those who have passed, distracted minds looking into bitter cups of concentrated coffee as they contemplated a smoke, teenage girls playing a quick game of “Spot the Handbag”. I could only think that I should have known him better, that I had never asked him what dish he missed most from his mother's kitchen, which meal he loved his wife to prepare, what he ate when he was busy fighting a war. I was so intimidated by his war hero history that I didn't allow myself to break the barrier of age. That is what I regret the most; but away from regrets, will I too one day turn to find an empty bed with loss sleeping next to me? Will I be lucky enough to have my close ones embrace my home as theirs, make it feel alive if only for a while until I feel slightly right again? When I am old, will the young forget that I was once young like them and uncomfortably shy away from my veiny hands? If I am certain of one thing, in death there is always finger food but no appetite — aniseed biscotti passed around to maintain some semblance of energy, store-bought cakes and crunchy breadsticks to break the awkward silences and moments of heartache, mugs heavy with coffee making rings on tabletops and several cans of cola, all in the hands of people dressed in black. The only solid decision I've made is to earnestly get to know the people in my life that I hold back from, ones that I will grow through because nothing replaces people's real life accounts of eras gone by, foods long forgotten and heroes of our past. A long forgotten favorite recently learned is 'Egga, an Egyptian dish dating back to the Ancient Egyptians who often used duck eggs instead of our common chicken egg nowadays. Beaten egg, parsley and onions with an optional diced tomato or potato are poured into a baking dish and baked in a hot oven making this an ideal family dish. These days, it's commonly referred to as a crustless quiche, belonging to no specific country, versatile, neatly carried and easy on the stomach in times of hardship. Preheat your oven to 190 degrees Celsius. Brush a mini muffin pan with oil. Place a medium-sized pan on medium heat. Sautee the mushrooms and onions until soft. In a large bowl, whisk together the eggs, egg yolks, milk, cream, salt and pepper. Add the mushrooms, onions and broccoli and stir. Reserve some on the side for later. Transfer to a jug. In the muffin pan, place some cheddar cheese to line the bottoms. Pour the egg mixture until just below the rim then sprinkle on top the reserved vegetables and cheese. Bake for 15-20 minutes. They should puff up and turn a light shade of golden brown. Allow to cool for 5 minutes before turning them out of the pan. For the salsa, roughly chop the green chilis, deseeding if you want to eliminate extra heat. In a food processor, combine the chopped chilis and tomatoes with the garlic. Add the water, cumin and lemon juice. Blend until desired consistency; I prefer mine on the chunkier side.